BriskHeat Corporation Product Catalog is now available for free download and purchase. 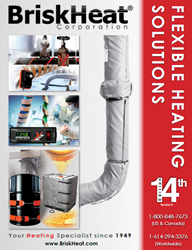 The updated catalog features new products, images and all BriskHeat flexible heating solutions. An updated 14th Edition Rev B product catalog is now available from BriskHeat Corporation, the leader in flexible heating solutions since 1949. The catalog offers many BriskHeat surface heating solutions to choose from for maintenance, engineering, production and procurement professionals. The new catalog features new products and new images throughout. It is available both electronically and in hard copy form for free. With 65+ years of experience, BriskHeat is committed to serving our customers with the widest range of flexible heating solutions including: heating cable, heating tapes, cloth heating jackets, silicone rubber heaters, etched foil heaters, drum heaters, tote tank/IBC heaters, temperature controllers, composite curing solutions, insulators and more. For more information or to receive a catalog, please visit BriskHeat at http://goo.gl/y9xPt5 or contact BriskHeat or a BriskHeat distributor today.